If you know me then chances are you already know how much I adore my favorite Mizfit from www.mizfitonline.com! But in case you are unaware, this woman is my hero. And while I’m sure she knows that she has impacted my life, I’m not sure she’ll ever know just how much she has impacted me me. 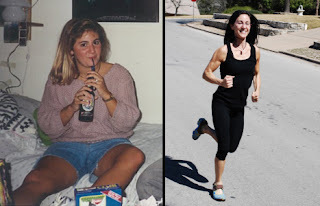 She is an authority on exercise, and today she’s sharing some basics for those you who may be interested in starting or restarting so listen up! And check out her before and after photo. Incredible, right? This woman is ripped! A seven word sentence which, when uttered by a health care provider, strikes panic in the hearts of most of us. Weight training or workout DVDs? On top of all the choices every expert seemed to point me in a different direction. With hindsight I’ve realized what felt overwhelming to me at the time can be summed up using the acronym START. Start slowly and set yourself up for success. The biggest mistake I made was exercising full tilt right from the outset. I ended up so sore it’s no surprise I quickly quit. If I could give one piece of advice to every new exerciser it would be do less than you think your body is capable of for the first week or two. Yes, it seems counterintuitive. You’ll find, however, by leaving your body wanting more you will quickly create an exercise habit you look forward to and enjoy. In addition, nothing feels better than setting goals and achieving them. Save the lofty, crazy stuff for after exercise is an ingrained habit. Try new things! Beginning an exercise program is not the time to cling to old notions about yourself. Seize this opportunity to soften your attachment to your self-definition. Ignore the voice in your head which says things like “Hip-hop cardio class is not for me.” or “I’m just not a woman who lifts weights.” This is your opportunity to create a new you both inside and out. A great (and inexpensive) way to try new workouts is by renting exercise dvds, searching for free online videos, or recording free on-demand workout shows on television. Add in movement everywhere. View your entire day through the lens of how can I fit in some extra exercise? Park far away from the store entrance and walk. You can even count lugging packages back to the car as resistance training. Take the stairs instead of the elevator. Pace around the house as you return that long list of phone calls. Skip the coffee-break in favor of a fitness-break and do some office lunges! This tip isn’t a new one yet, when I was completely honest with myself, I never employed it. Ever. All this extra activity is called non-exercise activity thermogenesis and it definitely adds up to calories burned. Realize that you are human and do have limitations. Listen to experts, gurus and well meaning friends, but remember you are the expert of your own body. Does an activity which is supposed to be ‘your level’ feel too difficult? Is the walk you did yesterday with ease feeling too challenging today? Don’t hesitate to take a day of rest or adjust a workout routine accordingly. Fitness, like most things, is not one size fits all. We may all have the same end goal of living a healthier life, but we don’t all need to take the same path there. Take time to recognize your successes. Initially I spent far too much time focusing on the scale and not nearly enough celebrating my non-numeric victories. The weight loss community has created a separate classification I adore called non-scale victories (NSVs). Can you finally plop comfortably in a movie theater seat? Celebrate that victory with a night out with friends. Are you far less winded after a 1 mile walk than you were a few weeks ago? New socks or shoes might be in order. Celebrate all your successes and don’t waste precious time worrying about others or only focusing on pounds shed. The five tips you need (and what I wish my doctor had told me) to get STARTed on your path to healthy living. Just last night, I wondered how to get started when I am over 300 pounds and everything hurts all of the time. Thanks for this post – it really speaks to my inner exerciser! Terrific post! I'm going to share it with some friends who are thinking of getting back into an exercise routine. Great Post & Tips…..Here is to Healthy Living!!!!! love this, love miz, love kenz. I just found your blog and wanted to say hello. Thank you so much for sharing your progress thus far – it really does help to motivate others – like myself! Thank you so much for this post! I've been rather hard on myself for not being able to get in very many workouts this week, but Miz's tips are helping me feel a bit better about it.